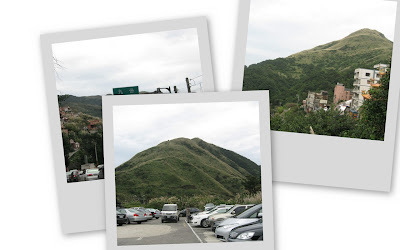 I Love Dino: Let's go to Jiufen (九份)! It was a great day one weekend and we decided to go on a road trip again! 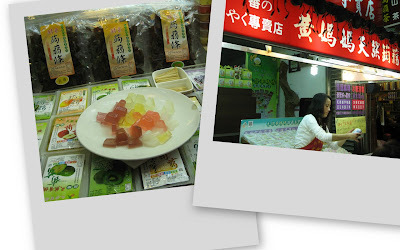 This time we went to Jiufen, a quaint little town just one and a half hours drive from Taipei city. 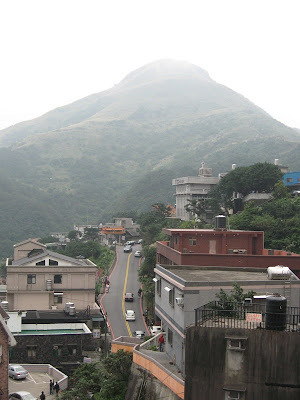 Jiufen is a mountainous town with steep, curvy and narrow roads and as usual, I got car sick and threw up in the car once we arrived. 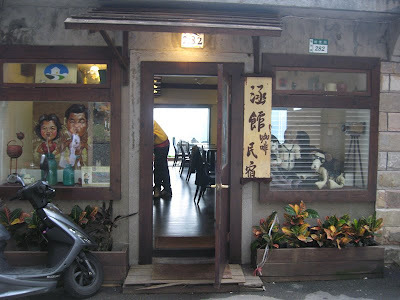 Jiu Fen means "nine portions" in Chinese and the town was named so because it used to house nine families and these nine households would order nine portions every time shipments arrived from town. The view was fantastic, it looked almost surreal. 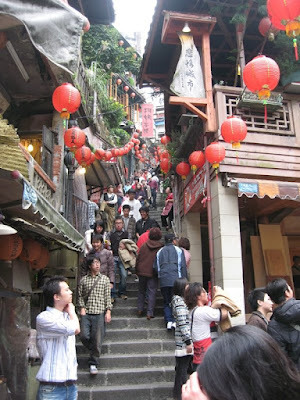 Jiufen used to be a prosperous gold mining town, but it quickly declined after the mining discontinued. Fortunately, the quaint streets, tea houses and stunning views of the Pacific Ocean saved it from becoming yet another anonymous mining ghost town. 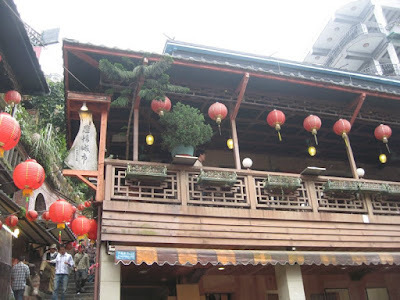 In 1989, Hou Hsiao-hsien's film, A City of Sadness set in Jiufen became a big hit. 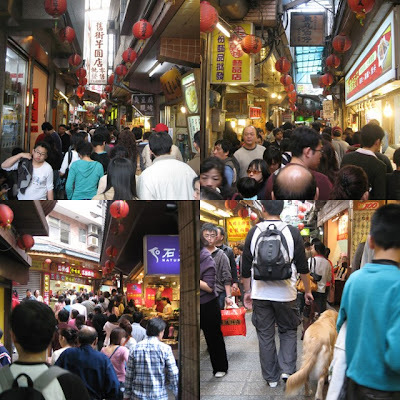 The nostalgic scenery of Jiufen in the film attracted many visitors and Jiufen became a tourist attraction. 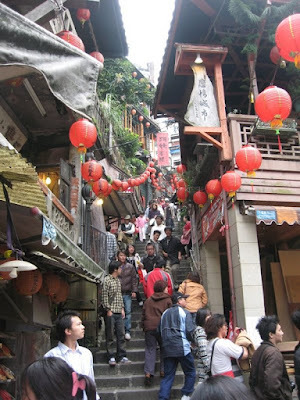 Jiufen again came into the limelight in 2001 when its downtown was used as a model in the anime movie, Spirited Away by Hayao Miyazaki. 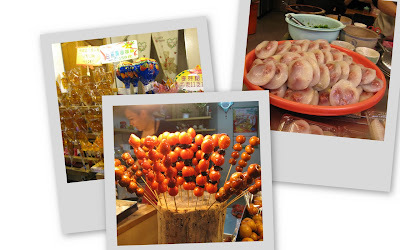 There are so many things to eat in Jiufen! 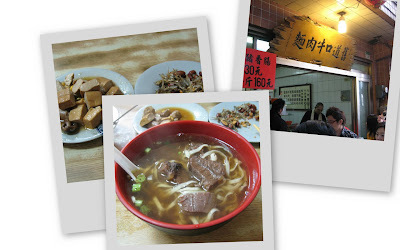 Delicious beef noodles in herbal soup. 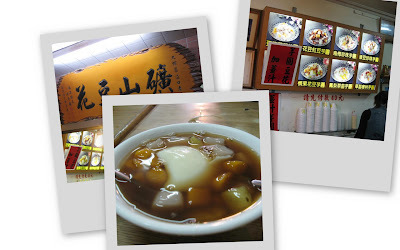 Desserts with sweet potatop and taro balls. 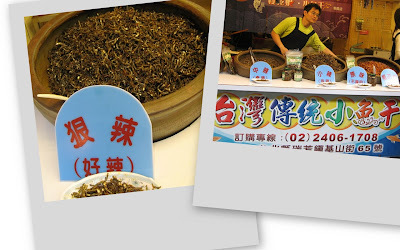 Yam cake (芋粿) and cudweed cake (草仔粿). 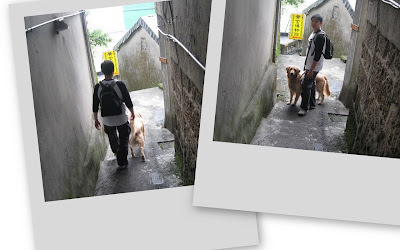 Many interesting alleys to explore. 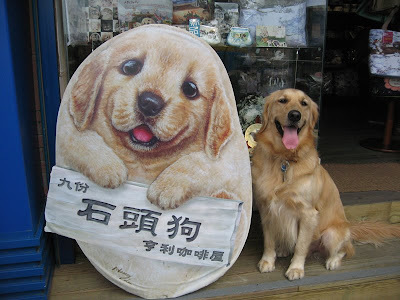 Golden retriever stone dogs for sale! Someone wants to get in the picture too! So many stairs to climb! And old stone houses to see. 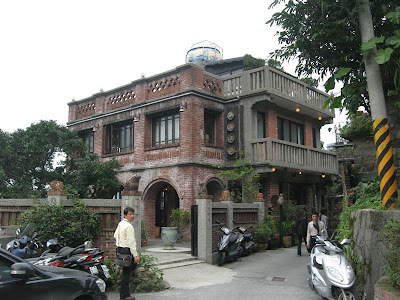 This restaurant called City Of Sadness Restaurant (悲情城市小上海茶樓), was featured in the film, A City Of Sadness, which won the Golden Lion at the 1989 Venice Film Festival. The famous flight of stairs. Ah! A movie poster! 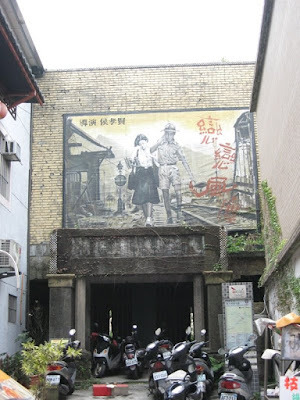 Many period films were set in Jiufen. Nice view of the mountain from the cafe. One more shot on the chair. Shots with my favorite humans. That's a cute Winnie the Pooh! 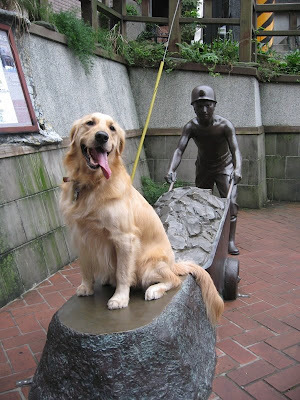 The gold miner and the golden retriever! Saying hello to a little friend. 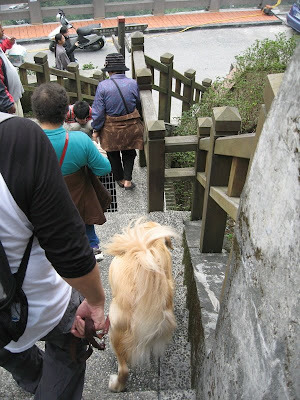 I hope you enjoyed this little trip to Jiufen with me! Thank you all for your kind words about my weight, but it has been confirmed that I am overweight. 40kg/88lbs! I have put on 6kg/13lbs in a year! Shocking! 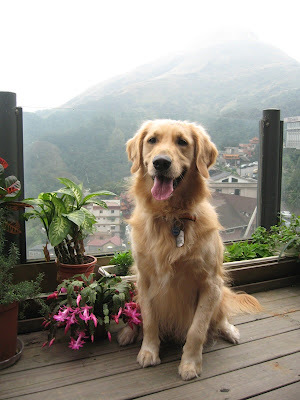 Life in Taipei must be good! I better shed some of that excess weight before summer comes. Time to work out again! You must got a lot of attention walking around that place. You look handsome as ever. we're very very very happy that you're came back!!!! we miss you a lot!!!!!!! your pictures are wonderful and great....as always!!!!!!! you're sooooooooooooo handsome and we love you so much!!! we think that your parents are more similar like ours....they take us with them wherever they go...and made live us the best life they can....don't you Dino????!!!!! we are very very very lucky!!!!! we love you so much and think of you often!!! P.s. : Congrats for your nomination on DWB!!!!!!!! We vote for you!!!! !..of course!!! 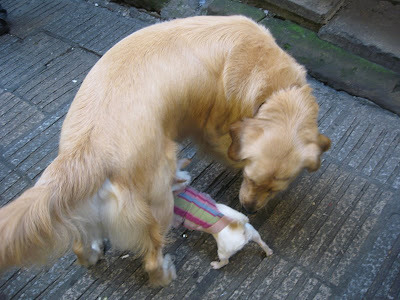 Your new little friend looks to be just about the same size as me! Thanks for sharing those pictures, they were so interesting! 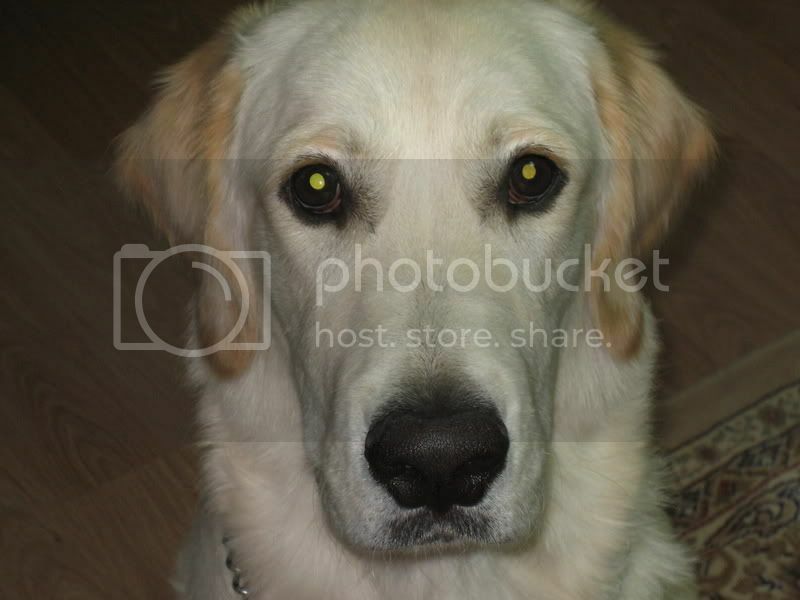 You are very photogenic!! 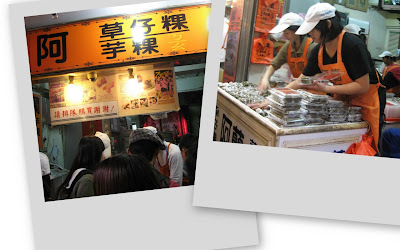 Thanks for sharing your trip to Jiufen! 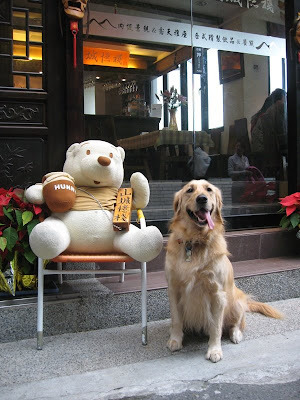 Looks like a pawesome place with very interesting things! I have to get rid of one kg too! What a great little town. Very busy. I loved all the scenery, especially the shots featuring you. Mom says she is going to check out that movie. Thanks for taking me on a trip. w00f's Dino, me loved all ur piksurs..hehee, dats cute dat little hooman snuck in on ur piksur..
That looked like a fun trip. 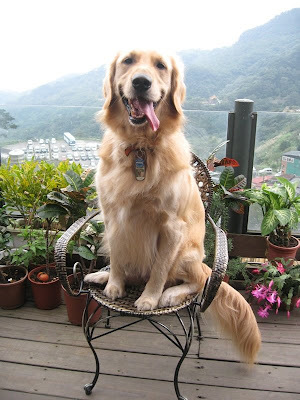 You posed so nicely in that chair. Remind your Mom that you got a lot of exercise walking up all those stairs, so she doesn't cut your food too much. Daisy gets car-sick too, she feels bad for you. Hi Dino! That looked like a fun trip! 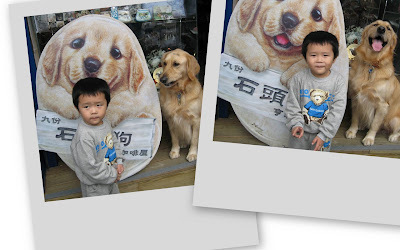 My favorite picture is the gold miner and the Golden Retriever. Congratulations on your nomination! Looks like you have fun D ! 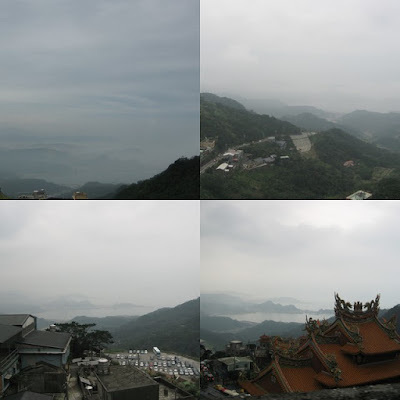 Thanks for giving us a tour of Jiufen, it looks like heaven! A lovely place with so many lovely shots! Thanks for the lovely tour! 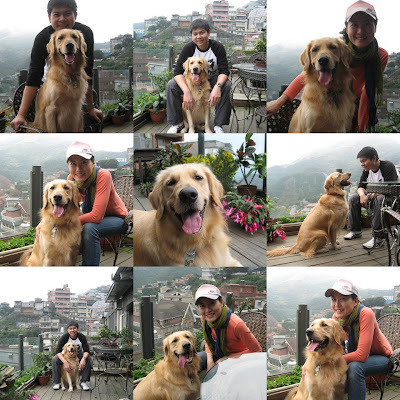 Dino, love your smiling happy face in the pictures! Wow Dino, that is a breathtaking place! It looks surreal, you live in one of the most beautiful places in the world, with a perfect climate, too. And you don't need to lose weight, I love the way you look. As for it which thought to see your a lot of images, you resemble Joey in appearance. Your pictures are so coooooooool ! Woof! Dino Happy Chinese New Year ... Great photos. You don't look overweight to us at all! We think you look STUNNING!!! What a fantastic tour, Dino!! 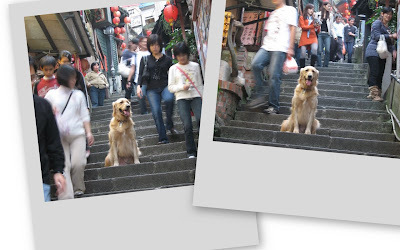 My human, Hsin-Yi, read about Jiufen in a magazine and she so wanted to visit...it was great to see your beautiful pictures. 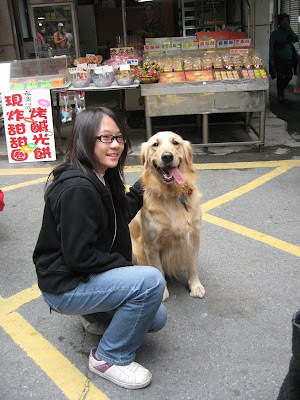 I am so sad that we never got to come and live in Taiwan and see all these great places...! !